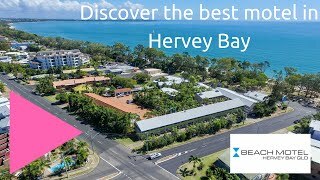 The Beach Motel Hervey Bay is surrounded by tropical gardens offering clean, simple and value for money accommodation situated on the Esplanade. There is a range of comfortable accommodation on offer, from standard motel rooms to larger self-contained apartments all with brand new ensemble beds, air-conditioning and most include a kitchenette. The motel has its own restaurant, landscaped pool and spa area including barbecue facilities. Other facilities include room service, mini bar, bike hire, Foxtel and tour desk.